Yeasted Blueberry Scones were inspired by Angel Biscuits, which are biscuits made with yeast. They have a crumbly, rich crust surrounding a crumb that is lighter than a baking powder biscuit and more like a roll or a soft muffin. So basically, you get the best of both worlds! Plus the scones are a little puffier and bigger, therefore you might feel like you’re getting more scone for the calories. Another benefit is that the scones are perfect for making ahead because you assemble the scones, let them rise, freeze, and bake straight out of the freezer — a trick I learned from King Arthur Flour. Their theory is that putting the risen dough in the freezer for an hour will re-solidify the bits of butter that are known for making biscuit and pie dough flaky. I’d say it works! 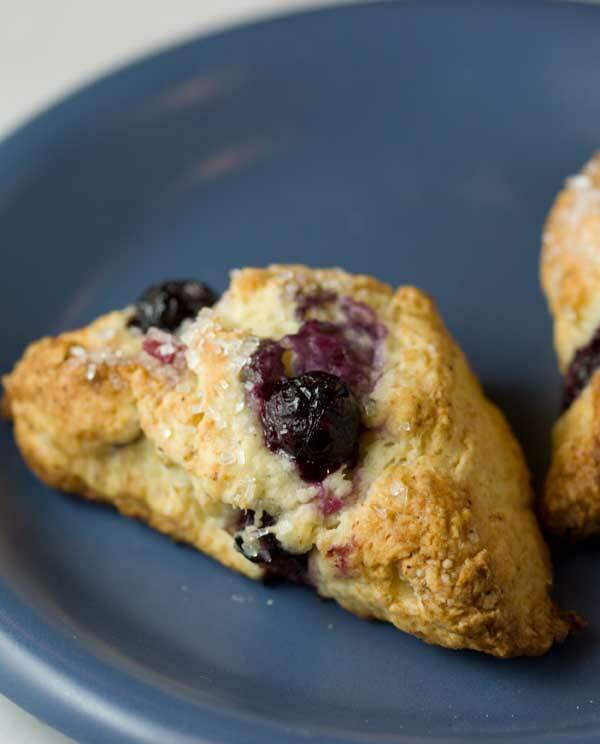 Blueberry scones made with yeast. Thoroughly mix the flour, sugar, baking powder, baking soda and salt in a large mixing bowl. Add the shortening and butter to the dry mixture, and with a pastry cutter or your fingers, work the fat into the flour mixture until crumbly. Add the yeast and stir well. Add the vanilla to 3/4 cup of the buttermilk, then pour and stir to make soft dough. Add the other 2 tablespoons of milk only if the dough seems very dry. Add ½ cup of the frozen berries and carefully stir them into the dough. Turn mixture onto a floured surface and shape into two 6x3 inch rectangles. With a floured knife, cut each rectangle into 8 small triangles. 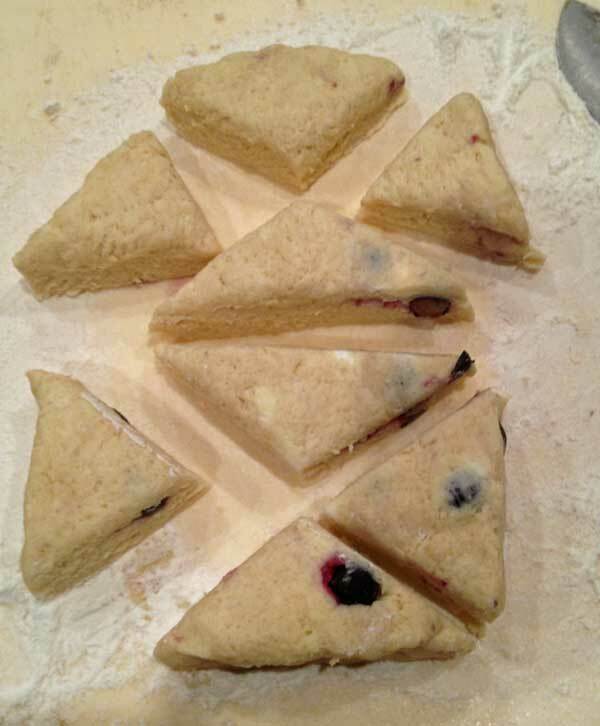 Arrange scone triangles on a nonstick or parchment lined baking sheet and poke the remaining blueberries into the scones. Cover loosely with parchment or nonstick foil and let sit for 1 hour to rise. After one hour, put the risen triangles (they won’t rise dramatically, but they will lighten) in the freezer for another hour or until you are ready to bake them. Arrange as many triangles as you want to serve on a parchment lined baking sheet and bake for 18-20 minutes or until golden and inside appears cooked through. Brush tops with melted butter and serve warm or let cool and drizzle with icing. McCormick’s Imitation Butternut & Vanilla extract, which is hard to find in Austin and which I have to order via Amazon, tastes great in these scones, but if you don’t have any, regular vanilla is fine. Make sure to measure the flour very carefully by spooning and sweeping the top flat. Also, if you are lucky enough to have some White Lily, you can skip blending the cake flour and all-purpose and just 100% White Lily. You'll need 11.5 oz or about 2 3/4 cups. If all you have is all-purpose and you really want to make these, they'll still be good. Use a total of 2 1/2 cups of flour which should be 11.5 ounce. Or forget the volume and just weigh everything. We enjoyed the Yeasted Blueberry Scones version, but chocolate chip was also terrific. It’s been a while since I made these. The key distinguishing feature was that they were lighter than regular scones. I have a number of scone recipes that I like a lot but am thinking if trying a blueberry version. Maybe with a lemon drizzle or glaze. In this recipe, the dough sits out for a bit while the yeast does its work so the butter does soften up a bit in the dough. Freezing it makes sense. But generally, I don’t think you need to freeze dough in traditional non-yeast scones because it is easier to keep the dough cold throughout the process. Freezing is convenient, though. These days I freeze almost all scone dough so that we can just throw triangles in the oven when ready to bake. Overall, this yeast method was fun and did create a lighter scone. I really wasn’t sure putting yeast in scone dough would be worth it, but I did enjoy the lighter texture and would do it again. And cinnamon chips would be great! Do you think placing scones in the freezer for 1 hr. is good practice for any scone recipe? I can see cinnamon chips in this recipe also.